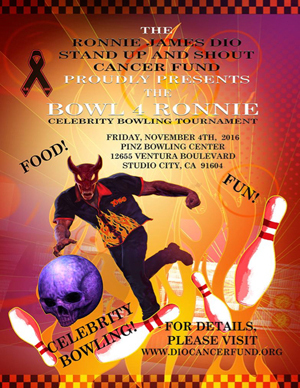 The 2nd Annual Bowl 4 Ronnie Bowling Party, benefiting the Ronnie James Dio Stand Up And Shout Cancer Fund, will take place on Friday, November 4th at the Pinz Bowling Center in Studio City, California. The event, which will be hosted by Eddie Trunk, will include a celebrity bowling tournament, a raffle drawing and a special live auction. The inaugural Dio Cancer Fund Bowling Party, held in May 2015 as part of the commemoration of the 5th anniversary of the passing of rock legend Ronnie James Dio, contributed to raising $155,000 for the cancer charity from that weekend's events. Bowl 4 Ronnie participants can anticipate an evening of fun, food, and, of course, bowling with rockers and celebrities competing for trophies in the name of raising funds and awareness for the Dio Cancer Fund. Among the raffle prizes will be a specially-designed bowling ball featuring the Bowl 4 Ronnie artwork (see below). The live auction will include music memorabilia and celebrity signed guitars, among them a 6-string Jackson guitar donated by Chris Broderick of ACT OF DEFIANCE, who will be in attendance, stage played while on tour with in 2012 MEGADETH (as well as autographed photos of Chris playing that same guitar). The event kicks off at 6:30 PM with open bowling and a VIP pre-party for lane sponsors, celebrities and their guests. Last year's Bowl 4 Ronnie drew artists such as Tom Morello, Lita Ford and Jack Black, fresh from his Grammy win for his version of Ronnie James Dio's song "The Last In Line" from the DIO tribute album, This Is Your Life. Proceeds from the sale of that double album were donated to the Dio Cancer Fund. Eddie Trunk, host of That Metal Show, plans to captain his own bowling team at the event, while rockers already expected to attend include Bjorn Englen (DIO DISCIPLES/TONY MACALPINE/YNGWIE MALMSTEEN), Chris Broderick (MEGADETH/ACT OF DEFIANCE), Eddie Money, Gonzo Sandoval and Phil Sandoval of ARMORED SAINT, Joe Retta (DIO DISCIPLES/SWEET), Marc Ferrari (KEEL), Matt Duncan (DC4), Shawn Duncan (DC4/BULLETBOYS), Robert Sarzo (HURRICANE), Rowan Robertson (DIO/BANG TANGO/DC4), Rudy Sarzo (DIO/QUIET RIOT/WHITESNAKE), Scott Warren (DIO/WARRANT) and actor/musician Sean McNabb (LYNCH MOB/QUIET RIOT/DOKKEN), with more names being added. "Last year was a blast, and we totally sold out the place," says Wendy Dio, co-founder/president of the Ronnie James Dio Stand Up And Shout Cancer Fund. "We hope everyone will come again this year to have some fun and raise money for a good cause." 100% of the net proceeds from the Bowl 4 Ronnie will go to the Dio Cancer Fund. Most recently, the Dio Cancer Fund presented a check for $25,000 to Dr. David Wong, Director of the Dental Research Institute at the University of California Los Angeles, to further his research into saliva testing for the early detection of cancer. Dr. Wong believes this simple, non-invasive test will be available for medical use within the next three years. For more information, visit the Dio Cancer Fund website HERE and to purchase event tickets, go HERE.